The DC Ranch community is adjacent to the McDowell Mountains, and conveniently situated to downtown Scottsdale & Phoenix area businesses, dining, shopping and cultural amenities via the Loop 101 freeway. The Gateway Trailhead to the south, offers miles if trails into the McDowell Sonoran Preserve. 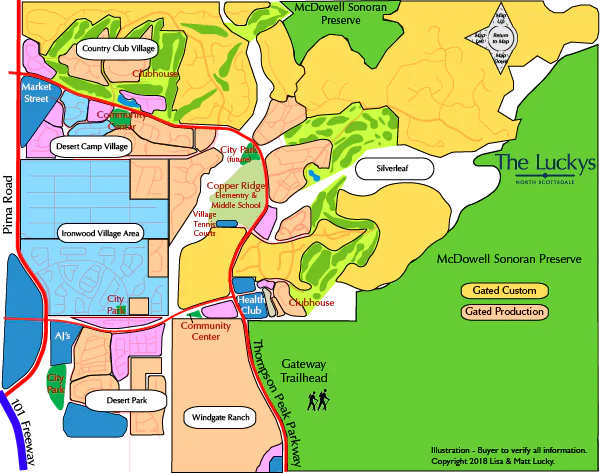 DC Ranch Area includes the DC Ranch community with it’s three Villages (Country Club Village, Desert Camp Village, and Desert Park Village) and Silverleaf. Also shown below are Ironwood Village, Pima Acres, La Strada, Toscana, and Windgate Ranch subdivisions. Note the Gateway is shown on this map. The Gateway is a major trailhead into the McDowell Sonoran Preserve, with miles of hiking and biking trails. These communities have easy access to the loop 101 freeway. Great shopping is available in the Market Street at DC Ranch – offers many fine dining destinations and exquisite shopping boutiques. See all DC Ranch Area New. See all DC Ranch Area Sold.